Players will place out blinds and antes (this is called posting). Each player is dealt two private cards face down. There is a round of betting, starting with the player to the left of the blinds. Players can call, raise, or fold. The betting round ends & the dealer discards the top card of the deck (a “burn card”). The dealer flips the next three cards face up on table (“the flop”). These are communal cards that anyone can use in combination with their two pocket cards to form a poker hand. Another round of betting occurs, after which the dealer burns a card and places a final card face up on table (called “the river”). 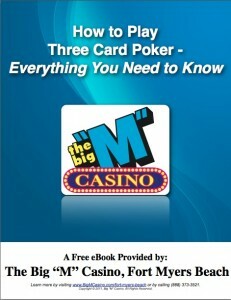 Players can now use any of the five cards on table or two cards in their pocket to form a five card poker hand. One final round of betting happens, then you have “the showdown”. This begins with the player to the left of the last player to call. Players use a combination of their pocket cards and the community cards to form a 5-Card hand. The player who shows the best hand wins! Each player places the ante into the pot. Each player is dealt three or five cards. Players to the dealer’s left bet or pass. Gather the cards if every player passes. Ante again, and have the player to the dealer’s left deal a fresh hand. 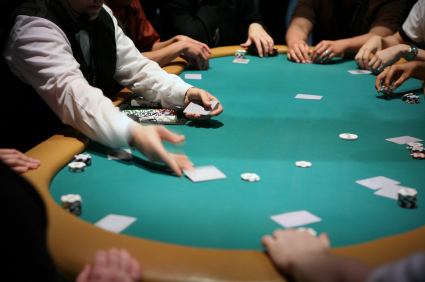 Subsequent players either call, raise or fold after a player opens a hand by betting. Once everyone has either bet or folded, each remaining player has the option to exchange some cards for an equal number from the top of the deck. Start another round of betting after every player in the hand has either exchanged his/her cards or stayed. The players who have not folded show their hands following the betting round. The player with the highest hand takes all the poker chips that are in the pot. The initial deal is two cards down and one card up to each player. 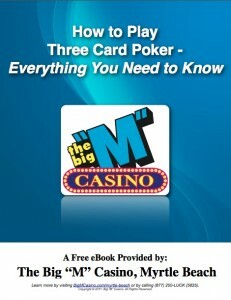 First betting round starts with the highest hand showing or the high card. Another card is dealt up and another betting round takes place. This is repeated until there are four cards face up. A final card is dealt down and the final betting round held. The ranking of the hands are the same as regular poker except you take the five best cards out of the ones you are dealt. Now that you’re well versed in the many different variations of poker, you can know which version you will have the most fun playing. Spin to win a free cruise and then reserve your seat on our Fort Myers Beach Casino Cruise or call us at (239) 765-7529. Check out our specials and then reserve your seat on our Myrtle Beach Casino Cruise or call us at (843) 249-9811. We look forward to seeing you aboard!